Since 2000, the Douglas Tidy Towns group, with the support of Douglas Community Association, has been working as a voluntary group to enhance our village. Our aim is to keep Douglas clean & litter free, enhance the visual attractiveness of public areas and to promote recycling among Douglas residents. Ever considered giving a helping hand? We welcome all volunteers! Volunteering doesn’t require a weekly commitment – just volunteer for an hour any Saturday morning that suits you. You are free to focus on a preferred area in your locality if you wish. 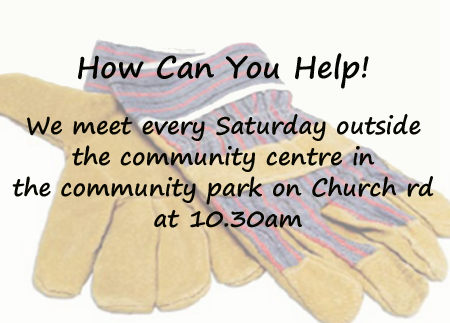 We meet Saturday mornings at 10.30 am outside the Douglas Community Centre. The exception to this are days of exceptionally bad weather and holidays such as Easter and Christmas – if in doubt contact us. All equipment (Hi-viz vests, litter pickers, bags & gloves) are provided. We are also happy to support local residents associations in their estate Clean-up days so please feel free to contact us. Give a helping hand & make a difference to your Douglas.